Hundreds of custom third-party plugins are offered for free by Moodle plugin contributors. Much like WordPress Plugins, Moodle plugins, once installed, change the look, feel and functionality of your LMS site to suit your requirements. Moodle’s category of available plugins is long and growing daily. To make things easier we’ve decided to share with you some must-have Moodle Modules to help you present, manage and administer pure online and blended learning sessions. Our Plugins webinar on January 23, will demonstrate how some of them work, including Face-to-Face, Real-Time Quiz, Drag and Drop Marking, and Attendance. We have also compiled a list of our all-time favorite plugins for various activities that you can review in the mean time. The training needs of many corporations and large teaching institutions require them to run a course that brings remote learners together physically, face-to-face in real-time. The Face-to-Face plugin for Moodle allows you to manage in-class instructional sessions inside your learning technology suite. There are several reasons why we recommend this plugin. For starters, it has been updated since Moodle version 1.8, and offers multi-lingual capabilities. Sure, we know the whole point of an LMS is to manage online learning, but sometimes companies use a blended online / face-to-face strategy. To round out an online course, an in-service training session, a series of live demonstrations, or face-to-face seminars, can be highly effective. These in-person training session can also be a compliance requirement for certain industries, such as emergency and first respondents. Some of the features that the Face-to-Face plugin offers include creating different course dates at various locations as in the screen capture below. 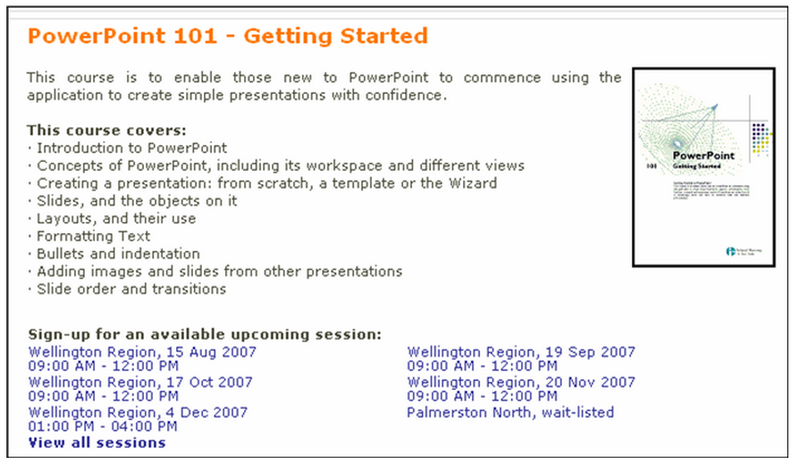 The administrator can set the date, time, session description and the number of seats available for each event. When an event is filled, it will be shown as 'wait-listed'. Learners cannot register for a course that is full, but they can indicate they would like to sign up by adding themselves to the wait list. When another student cancels, students on the wait list will receive an email letting them know they have the option to sign up due to cancellation. 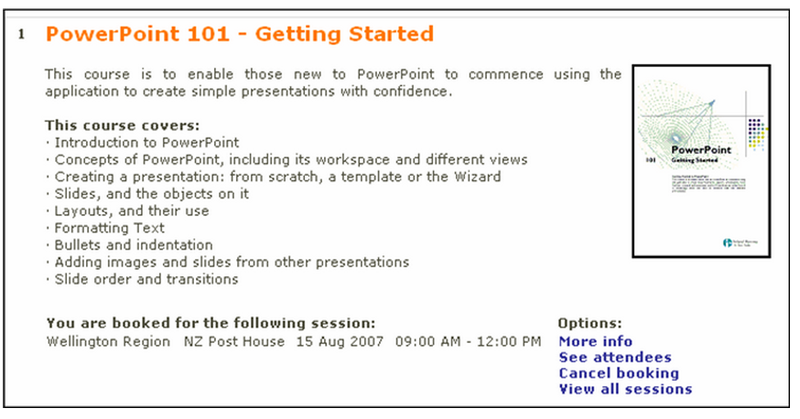 Learners can select the session most convenient for them from a number of locations and times. When they do select a session, the plugin asks them to sign up for the session, or cancel the request. In the course of signing up for a session, the plugin aids in the approval process by automatically routing the request to sign up to the learner’s manager for tracking and approval. Once the confirmation emails have been sent, the learner will see the following screen which allows them to see who else has enrolled, get more information and cancel their booking if something comes up to prevent them from attending. In addition to facilitating registration, the Face-to-Face plugin allows administrators to discount course prices and differential pricing. The plugin also automatically sends reminders about course dates to students to help attendance. It will also send an iCal appointment that students can use to schedule into their Outlook, Google or other iCal supported calendar solution. This plugin saves course administration time and allows a company to take advantage of an existing learning technology suite to manage face-to-face sessions either as part of an online course, or as standalone face-to-face events. To find out more about this plugin, and hear about Moodle plugins best practices from our experts, register for our January 23rd webinar. Check out our Plugins Guide, to learn more about what Moodle & Totara plugins might be right for you.